As your trusted Maplewood and St. Paul, MN dentist, we at Maplewood Dental Associates strive to do all we can to guarantee that each of our patients can receive a healthy smile. We aim to provide the widest range of general treatments so that we can treat any of a patient’s potential dental problems. One of these treatments that we use to improve our patients’ dental health from our Maplewood office is our root canal treatment. Root canal treatment, also referred to as endodontics, is a set of specialized procedures that are meant to treat problems of the soft pulp tissue within the tooth. It’s a common procedure that’s actually very similar to receiving basic fillings. 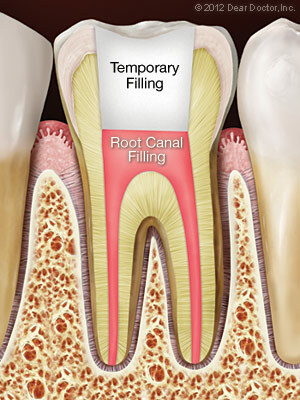 When infection or inflammation develops in the pulp tissue, a root canal procedure becomes necessary. The pulp tissue consists of blood vessels, connective tissues, and nerve cells, which is why you may feel pain if your pulp tissue is damaged – and why you should undergo root canal treatment. 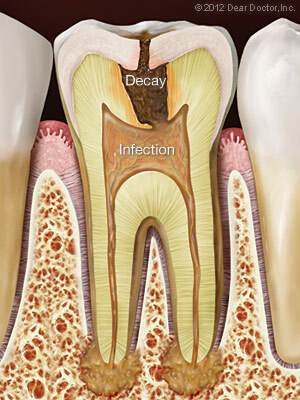 Deep tooth decay – Untreated cavities eventually allow bacteria to work their way down to the center of the tooth where they’ll infect the pulp tissue. 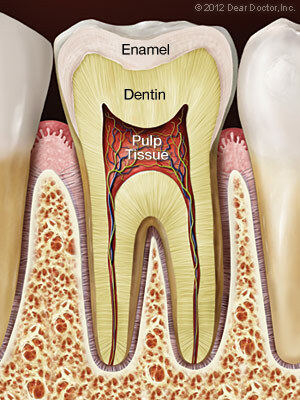 Chipped or cracked teeth – Like with tooth decay, any opening in the protective enamel coating may allow bacteria inside to infect the pulp tissue. Trauma to the tooth – Whether it results from a car crash, a sports injury, or something else, any blow to the face can cause pulp tissue damage. Extensive dental work – Even having too much dental work done can cause damage to the pulp tissue. Having multiple fillings or restorations on the same tooth increases the odds that a root canal may need to be performed. First, anesthetic will be administered to numb the tooth and surrounding area. After the areas are numbed, a small opening is made in the surface of the affected tooth in order to give access to the root canal and pulp chambers. Tiny instruments are then used, sometimes with the aid of a microscope, to remove the dying and dead pulp tissue within these passageways. The chamber and empty canals are cleaned, disinfected, and filled with an inert, biocompatible material. Adhesive cement is then used to seal the opening in the tooth to prevent future infection. It may be necessary to have a crown or other restoration placed on it to further protect the tooth and restore it to full function. Following this treatment process, your tooth may feel tenderness or sensitivity. This is normal though and should go away after a few days. If you’re in discomfort, we recommend over-the-counter pain relievers like ibuprofen, though prescription medicines may also be given if needed. Contact Your Maplewood and St. Paul, MN Orthodontist Today! If you’re looking to schedule an appointment with Maplewood Dental Associates, we encourage you to give us a call at (651) 770-3831 or fill out our online appointment request form. If you have any questions or comments, please feel free to contact us. We hope to see you soon and help give you a healthier smile!